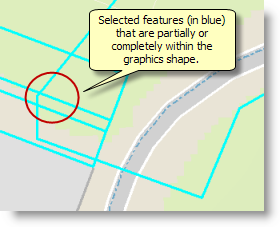 Selecting features allows you to identify or work with a subset of features on your map. You'll most likely work with selected features when you are querying, exploring, analyzing, or editing data. 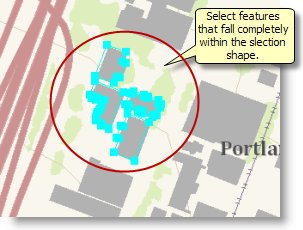 Applying a selection lets you specify the features you want to calculate statistics for, view attributes for, or edit or define the set of features that comprise a map layer. Use the Select Features tool on the Tools toolbar. Select their records in the Table or Graph window with your mouse pointer. 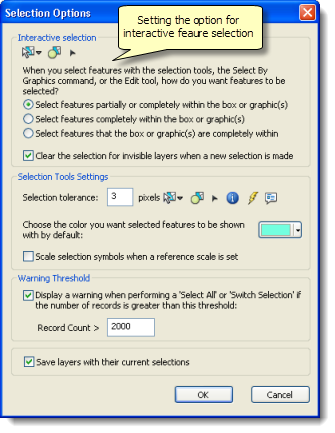 As you are selecting, the number of features selected is shown immediately in the lower left corner of the ArcMap window after you make the selection. It's also shown after the layer name on the List By Selection view in the table of contents. To add features to an existing selection, hold down the SHIFT key while you select features. To remove one or more features from a selection of multiple features, hold down SHIFT and click the features. 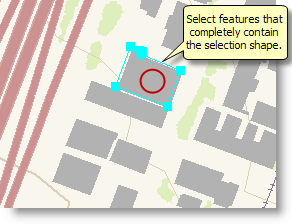 To deselect all selected features at once, click the map where there are no features, click a feature of a layer that is not selectable, or click the Clear Selected Features tool on the Toolstoolbar. Set the list of selectable layers. You can set and manage the list of selectable layers in the table of contents List By Selection view. 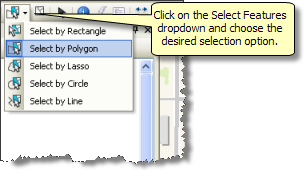 Select features that overlap the selection shape wholly or partially. Select features that are completely contained by the selection shape. Select the features that completely contain the graphic selection shape. Set this option by clicking Selection > Selection Options from the main menu. Set other selection options on this dialog box, such as the selection color and warnings on the number of features in selection results. Create a new selected set of features. Add to the current selected set. Remove features from the current selected set. Select features from the current selected set. Click Selection > Interactive Selection Method and choose the desired option. Click the Select Features arrow on the Tools toolbar and set the selection option. Digitize the selection shape in your data frame. 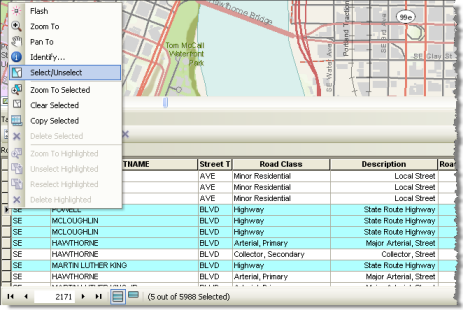 The set of selected features is highlighted in the selection color, such as the selected features shown in blue below. You can use the Switch Selection command to unselect all the selected features and select all the unselected ones. Right-click a layer in the table of contents and click Selection > Switch Selection. 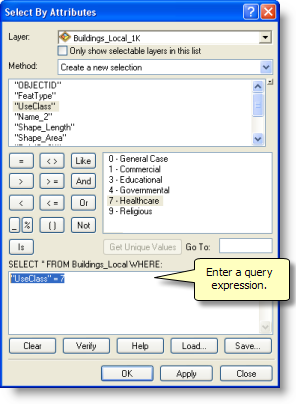 You can select features that match a query expression using the Select By Attributes tool. When you are working with the feature attributes of a layer , you can select records in the feature attribute table by clicking to the left of a record. Whenever you have selected rows in your feature table, you can right-click on any selected row and choose Select/Unselect. To select consecutive records in a table, click and drag the mouse pointer up or down, or select the record at the top of the set you want to select, hold down SHIFT, then select the record at the end of the set. You can select records that are not consecutive and unselect features by holding down the CTRL key as you click the feature. You can select features in one layer that overlap or touch features in another layer using the Select By Location tool. This allows you to overlay features from a selection layer and use these to identify features that overlap these selection features. See Using Select By Location for more information. When editing, you can also select features using special edit selection tools. See Selecting features while editing for more information. Click Selection > Selection Options on the main menu. The Selection Options dialog box opens. 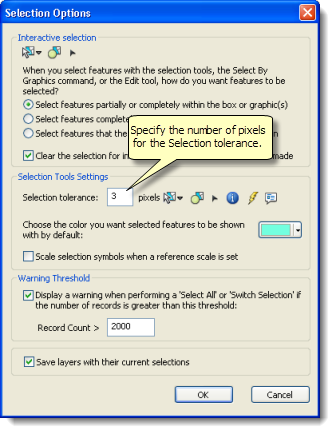 Specify the number of pixels you want to use as your selection tolerance when selecting features. A value of 3 to 5 pixels usually works well. A pixel count that is too small can be frustrating because it will be hard to precisely position and select features. 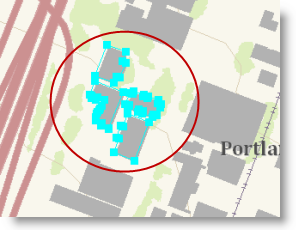 However, too large of a pixel radius will result in inaccurate selections. Selection will not necessarily find the feature closest to the cursor; it returns the first feature in the dataset that is within the tolerance.